During the early years of the 20th Century the village of Aberdyfi was growing fast. As a result there was a growing need for a public place suitable for social events such as concerts, musical competitions and meetings of various kinds. As a temporary measure these were held in chapel vestries and the village school, but it was soon realised that a much larger, and more permanent, building was needed. After the 1914-18 War many army camps up and down the country were closed and a good deal of army surplus material became available. In 1920 and old wooden building at an army camp in Oswestry came on the market and it was decided to purchase it for the village. A local builder, Mr Hugh Lewis (my father), was offered the contract to dismantle the hut, transport it to Aberdyfi, and re-erect it on a site in Penrhos, at the western end of the village. Later it came to be known by the rather grand name of 'The Pavilion': it was soon the focal point of village activities. Here many different kinds of entertainment were enjoyed over the years, with much excellent local-.talent on display. Competitive singing festivals, known as eisteddfodau, were held here too. Choral singing had long played a significant part in village life, and Aberdyfi had some talented mixed voice and children's choirs. You could, be sure that a concert held at the Pavilion would reach a high standard. These were days when home entertainment was in its infancy, telephones and radio were scarce and of course television was unknown. A few people had the odd gramophone or two, but generally people had to make their own entertainment. A strong amateur Drama Society flourished in Aberdyfi, and I can remember many wonderful performances at the Pavilion, from tense thrillers to rip-roaring comedies. Later on a local orchestra was formed to support the Drama Society. Then between 1951 and 1954 the role of the Pavilion changed. During that period it was used as a cinema, to the delight of young people under the spell of this new form of entertainment. There was something here to appeal to everyone. The social life in any community is always important, but in a small village it is even more so. The very closeness of people's lives means more sharing, more caring and, indeed, more socialising than in a city. This has certainly been the case in Aberdyfi, where the inhabitants have always been glad to come together for a festival or celebration whenever the opportunity arose. However, over the years the structure of the Pavilion began to deteriorate. The building still had no proper heating, and so audiences had to come prepared with warm clothes. A leaking roof did not add to their comfort. The situation was brought to head on a famous occasion when a meeting was interrupted by the opening of umbrellas during a shower of rain. At a well-attended meeting (uninterrupted by rain)'it was decided to approach the Council with plans for a new building, and a committee was formed to raise money for the project. As the Hon. Secretary, I had a large plan drawn up, and marked it out in squares, each to a total of £50. As the money came in, the squares were painted in red, which made a prominent display. This created much interest, and it contributed greatly to the substantial sum eventually given to the Council. 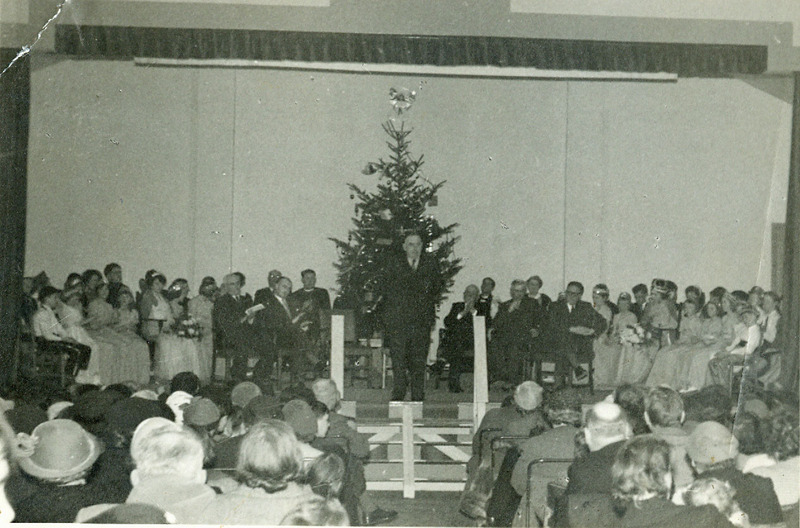 In 1957 the new hall, the Neuadd Dyfi as it was christened, was opened with a Civic Ceremony (see above). There was also a Ceremonial Concert, at which local artists took part, and a Pageant of Youth, arranged by Aberdyfi Primary School staff. The new hall has been used continually over the years for various functions, including visits by the odd touring company. Lately it has been less frequented. Once again it has been found that some vital alterations and improvements were necessary to make it an attractive venue for the 21st Century. This work is now going forward, and I believe we can look forward to a prosperous future for the hall.